pages from beth: 4 tips on how to get a good nights sleep. Since as long as I can remember I have struggled with getting to sleep. My mum used to give me a walkman (anyone remember those) before I went to bed with pop party inserted so that I would be able to fall asleep, even it meant listening to the cd twice through before this finally happened. But the struggle was mostly because how could you fall asleep when listening to "we're going to Ibiza, back to the island!" If I did not have this walkman I would become a complete mess of tears at the end of my mum's bed because it was 3 in the morning and I still hadn't slept. I don't have a clue where this came from or why I have never been able to sleep, although I now know when I can't sleep it is due to worrying about everything and anything. I know that as soon as I tuck in tonight and try and sleep I will not for hours and this is due to the fact I am worried about going back on placement tomorrow morning. Although I know I have no reason for this as I very much enjoy working with the children, but nonetheless I can bet you that I will see 3, maybe even 4 or 5 o'clock even though I have to get up at 6 for the next 6 weeks. But I do have a few ways in which I try to get my mind to shut off so I can get if only a few hours sleep and so I thought I'd share them as they have definitely helped me through many many years. Ok, so you know how I used to listen to music to help me sleep. Well for the last 5 or 6 years I find that one way in which I can sleep is by having a movie or tv series on. I know a lot of people are really against using technology to help them sleep as the light is supposed to make you feel awake. But honestly this is definitely my most used technique. I put on something through my laptop (favourites of mine are A Cinderella Story and The Perfect Man) but this is due to the fact that it enables me to turn my mind away from thinking about worries and I actually find myself focusing on the script to the point where I know it off by heart and because I concentrate on this noise it helps me to chill out and relax enough to drift off. I do generally turn the light of my laptop too, but sometimes the light can be comforting and because my room at University has streetlights which stream through the windows it's not too much of a bother, although sometimes I will just use an eye mask as complete darkness definitely helps to! This one is pretty simple and I do go into the help with this in another post, but having a Kindle bought for me for christmas was a life saver because not only can I read it with all the lights off, but it's not at all bulky to hold. It really helps to lull me to sleep. Not because the books are boring but because it's just peaceful and when I get caught up in a book it also helps stop the worrying! Designing in bed!? I hear you say? It's not what you may think as I am a big believer in not getting up and walking about when trying to sleep. Unless you really really cannot and it does calm you, as I believe it does wake your body up again and when trying to sleep I really want to relax my body as much as possible. But this trick was given to me by my mum. She would always tell me that if I couldn't sleep I should lie there and in my head design my dream my bedroom, right to every last detail (which is great at the moment as I am getting a bedroom soon and thinking about the decorating process, which I will blog) and then if you still haven't fallen asleep, move on to the next room and then the next until you either fall asleep or end up with your dream house! If I did happen to finish the house (which doesn't happen often) I end up going on to making up stories and adventures in my head. I have always been about wanting action and adventure in my life so I like to imagine all the places I could travel to and what could happen on the trips and if anything happens how will I fight away the bad guys. These help to and are a little embarrassing to mention as a young women, but hey if it helps me and it may help you then why not mention it! When I really am struggling I use smells to try and comfort me. This can simply be snuggling up to a boyfriends hoody (which is very shameful) but being in long distance it does relax me. 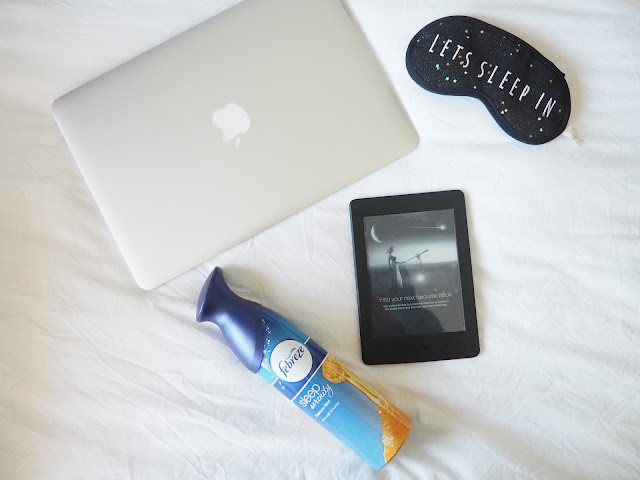 But also I find that spritzing the febreeze sleep range really helps and in particular the warm milk and honey range is a favourite of mine. I generally either leave the plug in on while I sleep or spray my pillow and bedding with it before climbing into bed as the smell really does not only relax my body but leaves me feeling much calmer. Another thing I use is the This Works Sleep Balm. I rub it onto my wrists and sometimes under my nose just to get a full effect and the lavender scent really does calm me down, unwind and I definitely couldn't recommend it enough! I'm even tempted to get the pillow spray at some point. So these are my tips on what help me to fall asleep. Sometimes I need a combination of a couple together and sometimes only one does the trick and if I'm very lucky, but mostly only when I'm with my boyfriend I don't need any of them. It's just about finding what works best for us to get that good nights sleep! Do you have trouble sleeping? If so I'd love to hear about tips and tricks you use to help! I totally make up stories in my head to get to sleep too! reading definitely helps me nod off to sleep instead of staying up on my laptop!